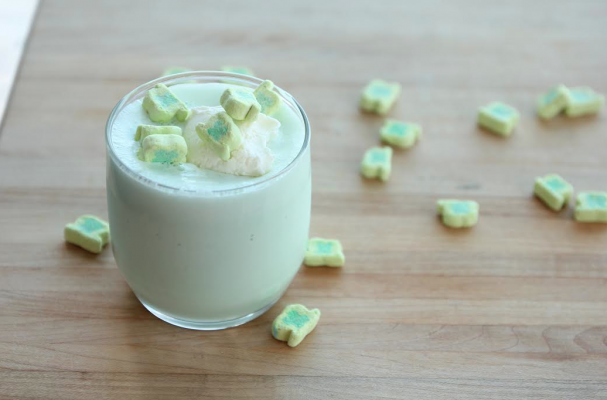 A Saint Patrick's Day celebration would not be complete without a shamrock shake. This minty green frozen treat can be tailored to any diet (even vegan), with or without booze, and even slightly on the healthy side. More importantly, this shake is about having fun and being festive on this Irish holiday. Step 1: In a blender, add vanilla ice cream, milk, creme de menthe, whiskey and Irish cream. Mix until well combined. Step 2: Pour into serving glasses and top each with whipped cream and garnish of your choice. Serve immediately. Step 1: Mix all ingredients together in a blender and puree until smooth and creamy. Serve right away. Step 1: In blender, place all ingredients. Cover; blend on medium speed until smooth. Step 2: Pour into 4 glasses. Serve immediately. Step 3: For added fun, top with whipped cream and Lucky Charms®.